Sleep paralysis is the terrifying feeling of being held down after just waking up or going to sleep. You can’t move or scream, and sometimes this paralysis is accompanied by the certainty that someone –or something — is in the room. Quite simply, sleep paralysis is one of the most horrifying experiences in life, because we feel awake but can’t believe what is happening to us. 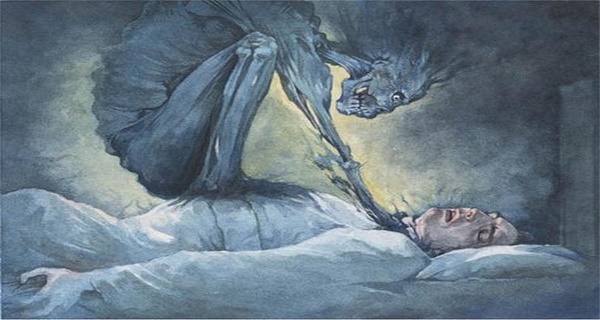 The truth is, sleep paralysis is a biological event and there is nothing to be worried about. You’re not dying. It’s a hiccup in the brain’s chemical soup as we transition from sleep to wakefulness. REM atonia is essential for healthy sleep, else you’d wreak havoc in your neighborhood by acting our your dreams on a nightly basis. This is no good for you, and no good for your neighbors. As you fall asleep each night, the electrical nerve impulses are cut off between your muscles and your brain. Your brain can still tell your body to do stuff (such as run away from Saruman’s dark army in yet another orc-fueled nightmare) but your body won’t respond. So far, so good. But what happens if you wake up and the REM atonia remains in place, albeit only for a few seconds? This is when we trip into the territory of sleep paralysis. Here we compiled 6 ways to get out now. Relax your body into the paralysis. Don’t fight it forcefully, as this creates panic and increases the chance of having scary hallucinations. Try to gently wiggle your fingers and toes. These tiny movements will eventually tell your brain that your body is awake and to stop the atonia. Try to move your eyes by blinking and looking around the room. Again, the goal is to establish waking-like movements to fully awaken your brain and body together. Try to move your lips and facial muscles. Focus on breathing as slowly and deeply as you can. If your breathing feels restricted, remember that you have been breathing fine like this while asleep for hours. Maintain a calm and positive mental state. Focus on relaxing thoughts. Imagine a beach in the sun, a million miles away from the darkness of your bedroom. Sing an upbeat song in your mind. The Ultimate Method We know — we said 6 ways, but this is the single best way to wake up from sleep paralysis and it’s really in a class of its own. When you realize you are in SP, scrunch up your face. In other words, make a face like you just smelled something bad. Snarl and squint. Do this two or three times in a row and the paralysis will break IMMEDIATELY. We’re not sure why it is so effective, but unlike the pinky wiggle, this method is foolproof.